It’s cookie time and these cookies are absolutely DELICIOUS!! 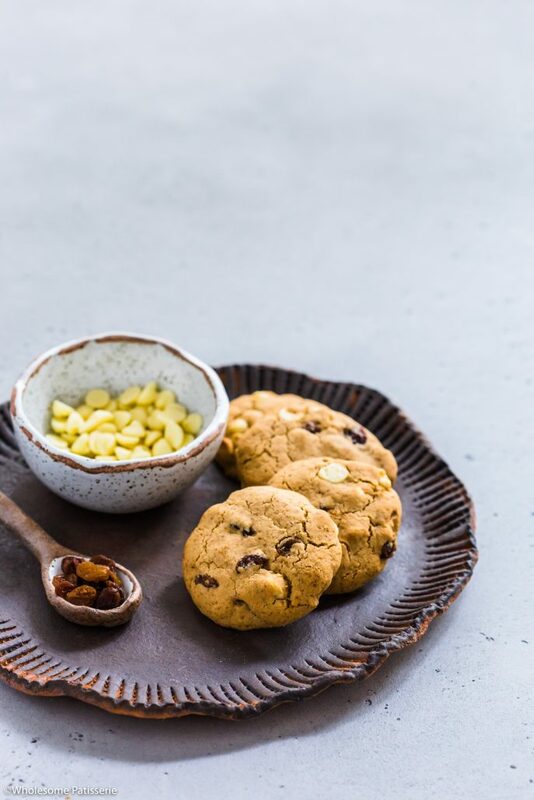 These cookies are made in one bowl (well technically 2, but mainly 1, haha) but they’re super simple and make for a wonderful snack for you and the family! 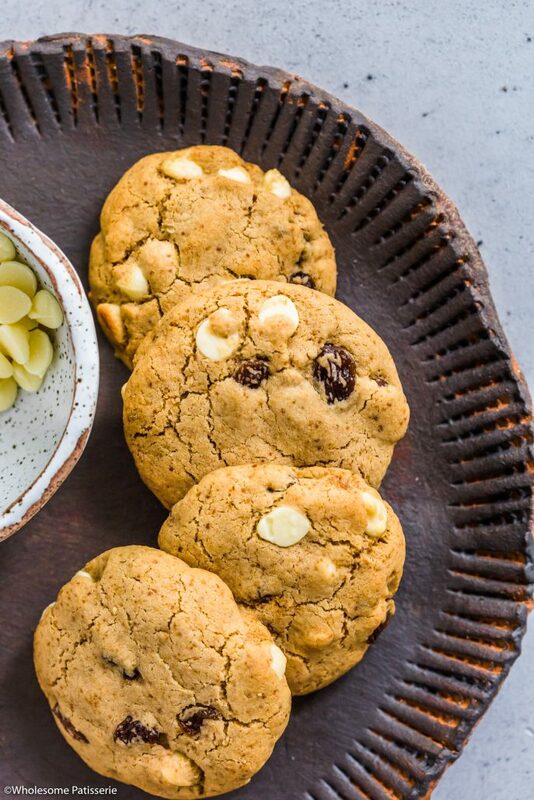 I took one of my cookies recipes I already have on my blog ‘White Chocolate Macadamia Cookies’ and basically omitted the macadamias and replaced them with sultanas instead but, they take on a whole new cookie! Whipping up a batch of cookies is never going to disappoint anyone and especially not yourself, that’s why I love baking cookies whenever I have a baking day at home. Seriously, cookies are the BEST little sweet treat you can have in your pantry to grab whenever you desire. So, I hope you enjoy these delicious and delightful white chocolate chip and sultana cookies! The sultanas add a texture of softness and sweetness, you’ll adore them! Combine flour, baking powder and baking soda together in a mixing bowl. Set aside. Add egg and vanilla, whisk until light, fluffy and smooth. Gradually add in flour mixture, whisking well until it begins to form a soft dough. Fold through white chocolate chips and sultanas. Form into a dough, wrap in cling film and refrigerate for 15 minutes. Remove from refrigerator and form into balls/cookies. Approx. 2 tablespoons worth each. Place onto prepared tray, pressing down on them slightly, you don’t want them as a complete ball so press them down halfway. Leaving 2 inches between each cookie as they do spread. Bake for 7-9 minutes or until lightly golden. Remove and cool on tray for 10 minutes. Store in an airtight container, in the pantry or refrigerated, for 4-6 days. If you would prefer a complete vegan version, replace the regular egg with a flax egg. 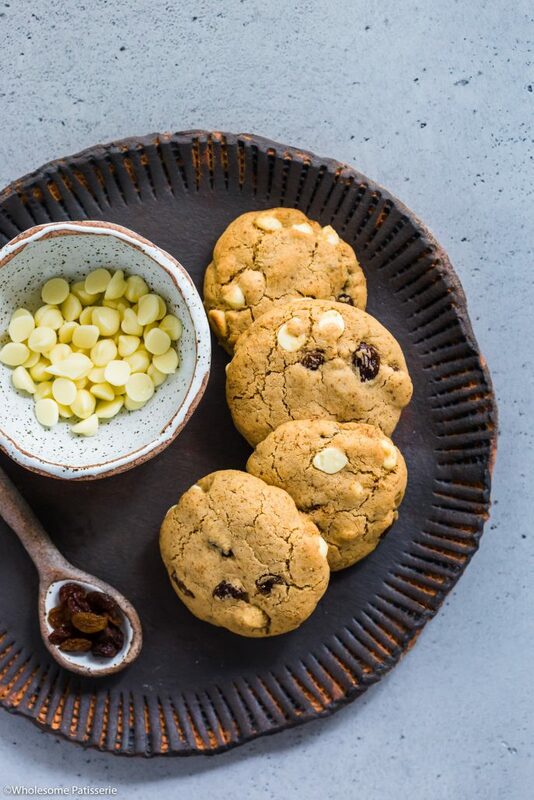 You may also want to use dairy free white chocolate chips.